The Lawns01263 715779work01603 870304fax Self-cateringThe Lawns is a handsome late Victorian, Early Edwardian town house in the wonderful seaside town of Sheringham, situated just a few minutes walk from all the amenities the town has to offer as well as the stunning beach. This property has been beautifully furnished to a very high standard and is perfect for a special family holiday. Utilities: Range cooker consisting of electric double oven, gas hob, combination microwave, wine fridge, fridge/freezer, dishwasher. Rooms: 5 Bedrooms, 2 Bathrooms, 2 en suites, 1 kitchen/dining room, 1 sitting room, 1 drawing room, 1 utility/laundry room, 1 cloakroom. Other: Towels. Books and games. Travel Cot. WiFi, stairgate, toy cupboard, pay as you go mobile for guests use. Outdoors: Elegant front garden, fully enclosed south facing rear garden with lawn, patio, table and chairs. The Lawns offers weekly bookings starting on Friday. 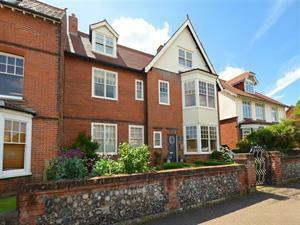 The Lawns is a handsome late Victorian, Early Edwardian town house in the wonderful seaside town of Sheringham, situated just a few minutes walk from all the amenities the town has to offer as well as the stunning beach. This property has been beautifully furnished to a very high standard and is perfect for a special family holiday.